000, which is far beyond the possibilities of any of the three methods proposed. We now turn to the interference method. Some preliminary experiments showed that there were possibilities in this method. The fact to which we have just drawn attention— namely, that the w’avc lengths are the same to at least one part in 500,000—looks particularly promising and leads us to believe that, if wTe had the proper means of using the waves and of multiplying them up to moderately long distances, without multiplying the errors, they could be used as a standard of length which would meet the requirement. 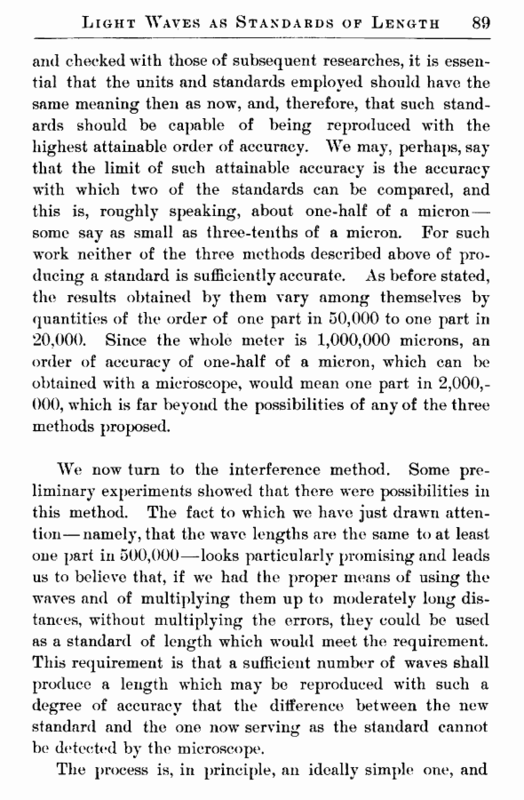 This requirement is that a sufficient number of waves shall produce a length which may be reproduced with such a degree of accuracy that the difference between the new standard and the one nowT serving as the standard cannot be detected by the microscope. consists in counting the number of waves in a given distance. However, in counting such an enormous number, of the order of several hundred thousands, one is liable to make a blunder — not an error in a scientific sense, but a blunder. Of course, ultimately, this would be detected by the process of repetition. The investigation, in a concrete form, presents a number of interesting ]>oints, involving problems of construction of a unique character which had to be solved before the process could be said to be perfectly successful. The construction and operation of the apparatus will be much more readily understood if we first dwell a little upon the conditions that are to be fulfilled. Suppose, for illustration, that it is required to find the distance between two-mile posts on a railroad track. 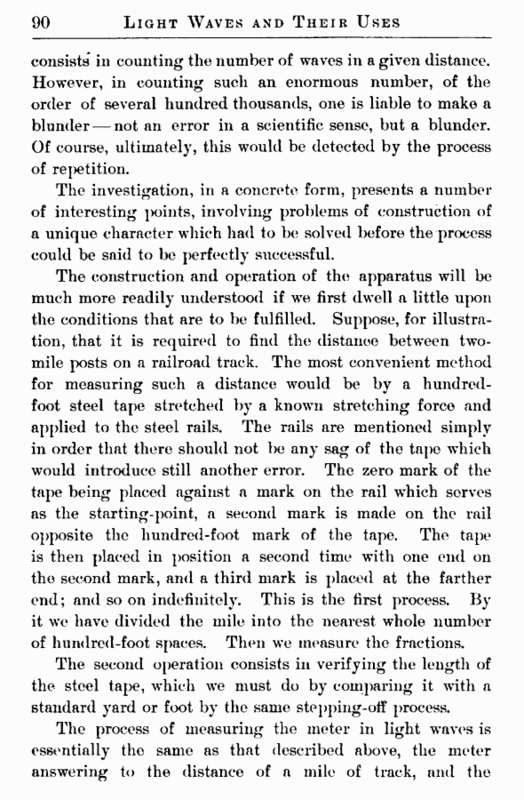 The most convenient method for measuring such a distance would be by a hundred-foot steel tape stretched by a known stretching force and applied to the steel rails. The rails are mentioned simply in order that there should not be any sag of the tape which would introduce still another error. The zero mark of the tape being placed against a mark on the rail which sorves as the starting-point, a second mark is made on the rail opposite the hundred-foot mark of the tape. The tape is then placed in position a second time with one end on the second mark, and a third mark is placed at the farther end; and so on indefinitely. This is the first process. By it we have divided the mile into the nearest whole number of hundred-foot spaces. Then we measure the fractions. The second operation consists in verifying the length of the steel tape, which we must do by comparing it with a standard yard or foot by the same stepping-off process.